The sitter was the wife of Thomas Howard, the 2nd earl of Arundel, an important figure at the English court, a noted patron of the arts and literature and the owner of one of the finest collections of painting, sculpture and singular books in Europe. The couple belonged to the rare elite of the English Catholic nobility. 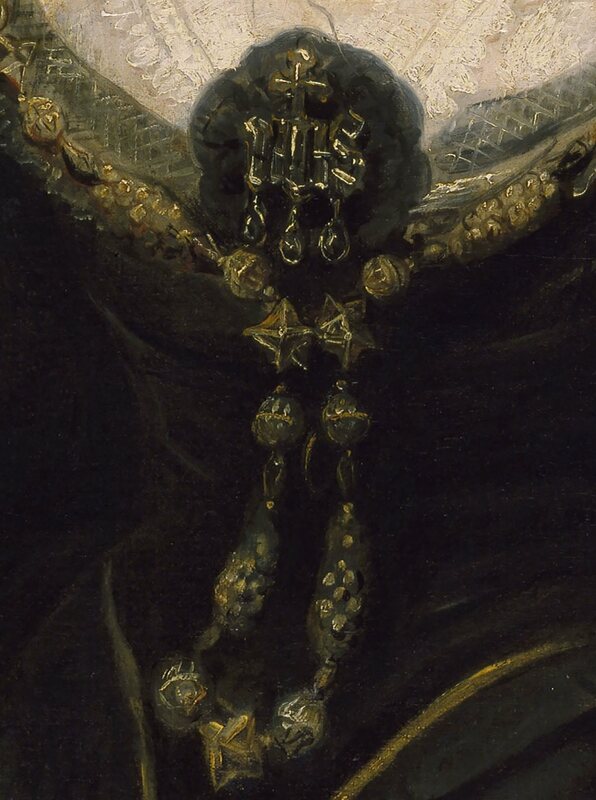 The subject is ostentatiously wearing on her chest a highly prized family jewel bearing the trigram of Christ’s name (IHS), with which she demonstrates her religious faith. 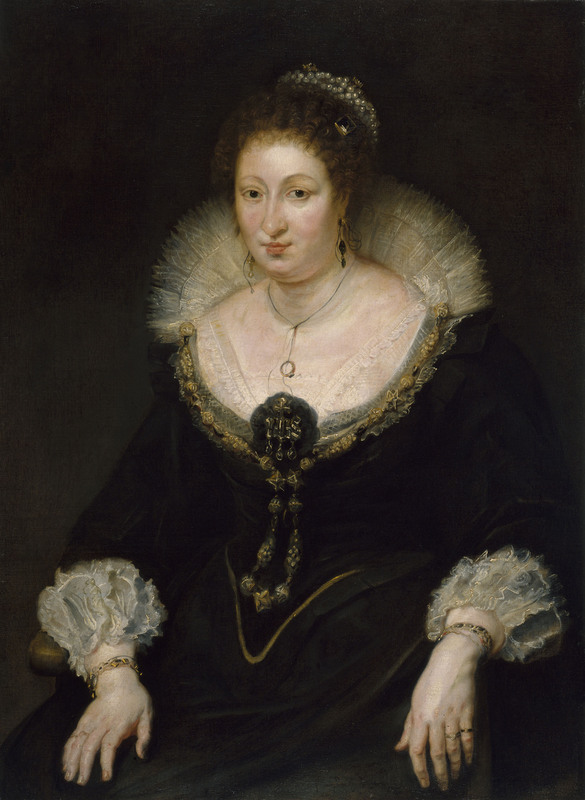 Rubens paints her as middle aged; he accentuates the lady’s features in order to emphasize her strength of character and determination, and he neutralizes the more aesthetic aspects of the composition. Rubens’ style has often been called excessive, due to the emphasis on colour, free-flowing brushstrokes and sensuality. This work shows us his art in his mature period, profoundly influenced by Titian, with dark shades and rich textures. This means black applied in differing degrees of intensity (broken only by the white of the clothes and the carnations) and the freedom of the painting over the precision of the drawing. This extreme technical skill enables him to capture psychological aspects of the sitter. 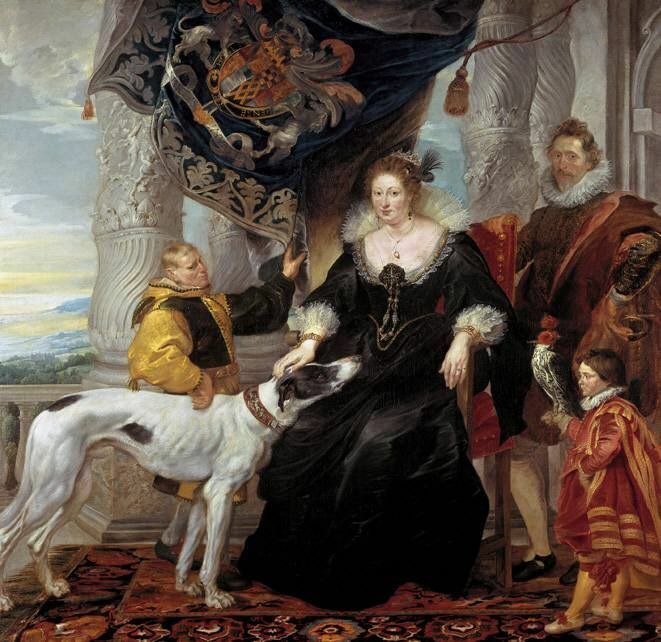 The work was made in 1620 in Antwerp when, on her way to Italy, the countess posed for Rubens for a group painting that is in the Alte Pinakothek in Munich, and in which she is accompanied by the English ambassador, her dog, her dwarf and her fool. Then aged 21, Anthony van Dyck was a member of Rubens’ workshop and there is a possibility that the master may have invited the disciple to work on the painting of Lady Alethea. The young apprentice’s influence can be seen in details of the portrait. Curiously, that same year, Van Dyck travelled to London and worked for the Earl and Countess of Arundel. 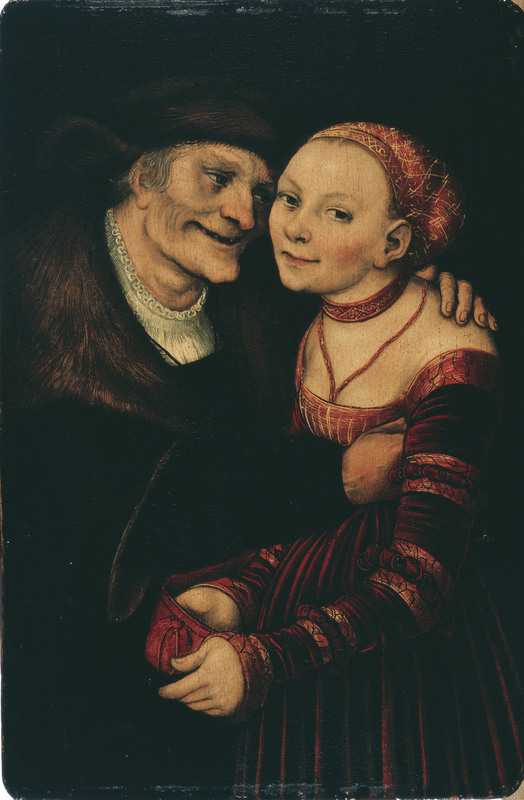 The painting is of a young woman robbing a careless old man who has been captivated by her feminine charms. The young woman takes advantage of the fact that the old man is concentrating on embracing her to steal his bag with great ease, smiling in satisfaction at the same time. The theme of the amorous couple of different ages is a long-standing tradition in Western culture, especially in literature, which became widespread in the first half of the sixteenth century, especially in Flanders and Germany. Given Cranach’s friendship with the religious reformer Martin Luther, it should come as no surprise that the image also contains a moralizing message, a warning about men’s need to repress their lustful impulses. It is an iconography that presents a misogynistic view of women, showing them as an instrument of the devil, a dangerous being who generates sin, humiliation, perdition and death. She uses men’s primitive instincts for her own material gain. 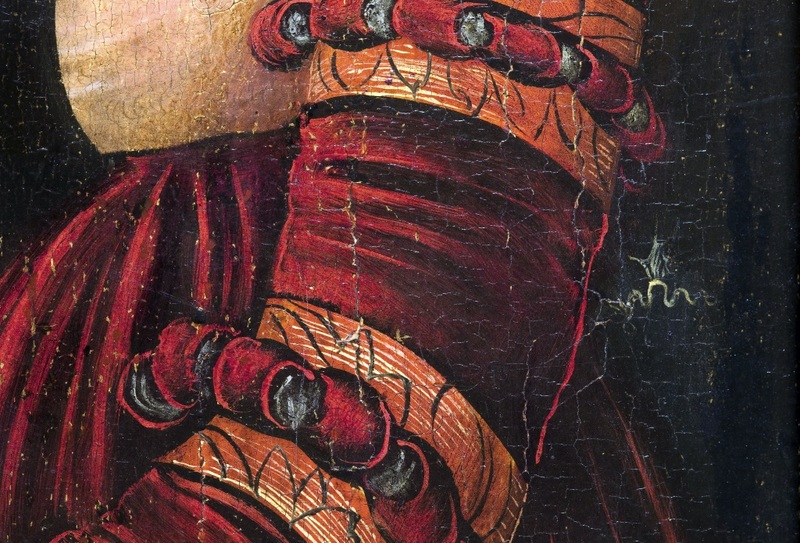 The work is signed and dated next to the young woman’s arm with the artist’s emblem: a small dragon with its wings raised. This work by the painter from Crete entered the museum in 1932 as part of the Plandiura collection. The central theme of this painting is the meeting between the apostles Peter and Paul, who had had a disagreement. It is a reconciliation that is timidly insinuated in the hands that interweave and never actually touch, but it also seems to be a gesture of yielding or acknowledgment by Peter. Peter appears here as a tired old man among the clouds, which open on to the blue sky to stress his aura of holiness. Next to him the powerful image of Paul appears – without a halo – in a green tunic and a vermillion cloak, middle aged, proudly holding the sword or attribute that belongs to him. The work demonstrates the great thematic wealth and the colour typical of the Cretan master’s art. 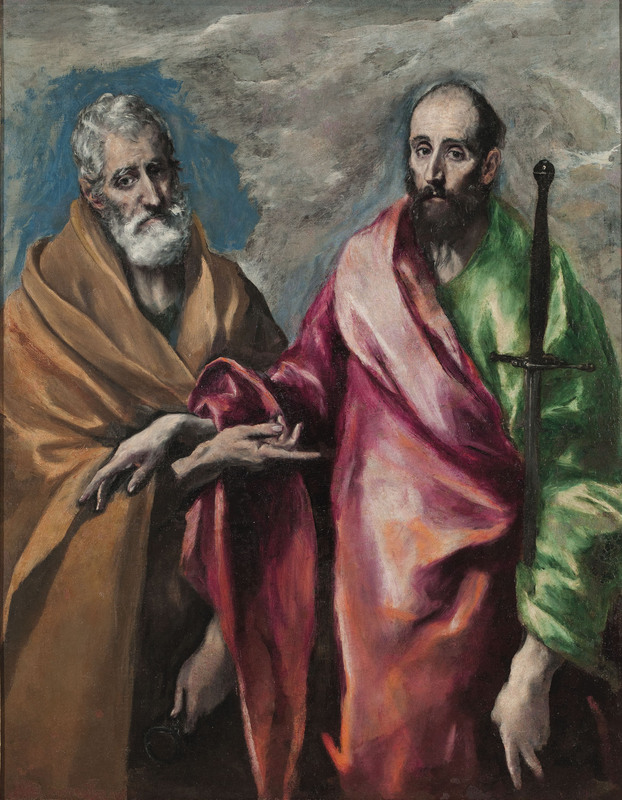 El Greco gives the figures of the apostles an inner light, materialized bodily in the stylization of the fingers, endowed with extreme grace and sensitivity, or in the illumination of the faces, which reflect a state of spiritual serenity. The monumental figure of a middle-aged man, sitting on a stone plinth, stands out against a plain background of earthy hues. He is wearing a thick cloak of brown cloth that covers the red tunic and hides the voluminous mass of the body. His hair is dark, his beard white and his face is deeply wrinkled. He holds a book that indicates his status as an apostle, and perhaps also an intellectual or philosopher. Above on the left, an inscription appears that clearly identifies him: “S. PAVLVS”. This iconography substitutes the saint’s traditional attribute, the sword. 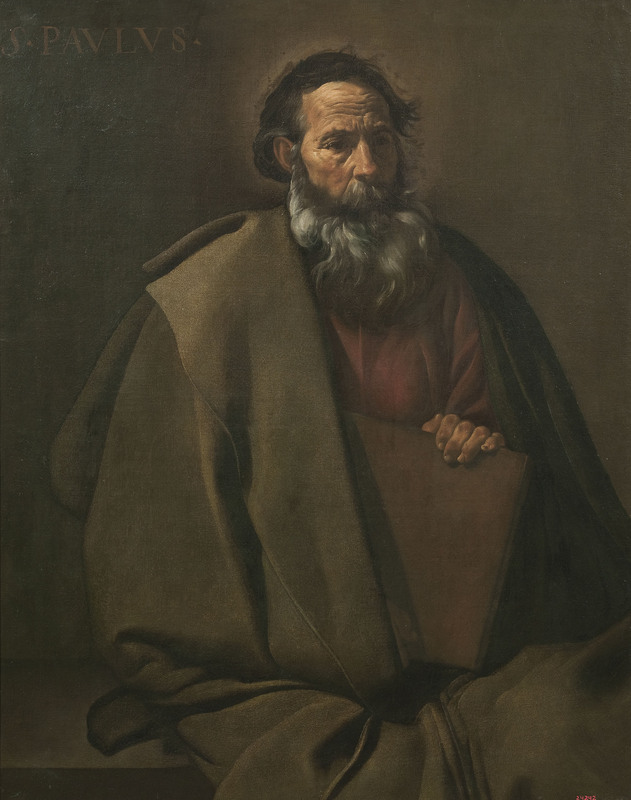 And it brings him close to the intellectual air of the series of the philosophers painted by Josep de Ribera. The halo of light around his head declares his saintliness, and makes the figure stand out against the background. It is a painting from the period of his youth when Velázquez was still living in Seville. The way of doing the wrinkles, the beard and the creases in the clothes are characteristic aspects, present in the majority of the productions corresponding to the painter’s period of activity in Seville, before he moved to Madrid and became the finest painter at the Court of King Philip IV. This work, internationally famous, is considered fundamental for studying the influence of Caravaggio’s pictorial realism in Spain. Opening of the new Renaissance and Baroque galleries!